High school fraternities have become a rare find in recent years, as more and more schools do not allow them to be created. If you are a students, please get permission from your school administration before creating a fraternity. For those high schools who still permit fraternities on high school campus, graduation cords are one way to show appreciation for the good influence the fraternity brothers have had on each other and their communities. Fraternities are often great sources of service and philanthropy, and are usually made up of several young men who are very talented either in their academic goals, or in their extracurricular activities. Honor cords are a great way for a school to acknowledge this beneficial experience in a young man's life and to show respect for the members' hard work and effort. Graduation cords from Honors Graduation are made from high quality, all synthetic rayon, and will last through your commencement exercises and well beyond. As you high school fraternity members prepare to move on to college and possible join a new fraternity, offer them encouragement by giving them an honor cord as an acknowledgement of their success so far. Graduation cords can serve to not only reward students for their achievements, but also to inspire them to continue in their success for the rest of their lives. In a world where brotherhood and community service seem to be undervalued traits, your students need all your support, and a graduation cord is one way that you can show that support. And since our honor cords come in such a wide variety of colors, including braided cords that feature multiple colors, you're sure to find the perfect honor cord. 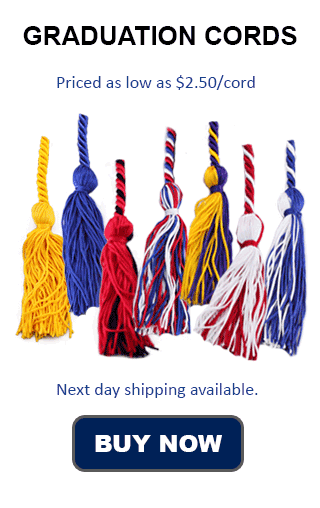 Our honor cords are the perfect gift of recognition for your fraternity members as they prepare to leave high school. At such a low price, you're getting an amazing deal on some high quality honor cords, and with our low flat shipping rate, you know your cords will be there quickly at the lowest possible cost. We also have a great deal on bulk orders, so no matter how many students you need to accommodate, you can count on our low prices.